Another terrifying sci-fi page-turner from the author of The Tomorrow Code! Las Vegas is gone—destroyed in a terrorist attack. Black Hawk helicopters patrol the skies over New York City. And immersive online gaming is the most dangerous street drug around. In this dystopic near-future, technology has leapt forward once again, and neuro-headsets have replaced computer keyboards. Just slip on a headset, and it’s the Internet at the speed of thought. For teen hacker Sam Wilson, a headset is a must. But as he becomes familiar with the new technology, he has a terrifying realization. If anything on his computer is vulnerable to a hack, what happens when his mind is linked to the system? Could consciousness itself be hijacked? Before he realizes what’s happened, Sam’s incursion against the world’s largest telecommunications company leads him to the heart of the nation’s cyberdefense network and brings him face to face with a terrifying and unforeseen threat. Brian Falkner, author of The Tomorrow Code, has created an action-packed and thought-provoking science fiction adventure in which a brilliant young computer hacker fights to prevent the human race from being deleted. A cyber-thriller that reads like a video game. Sam Wilson isn't out of high school yet, but he's on his way to becoming the most wanted hacker in the world--first for crashing the international computer grid (well, he didn't mean to), then for subverting the White House security system (OK, that was on purpose). But when he escapes from federal custody, he learns that his country needs him: Terrorists prowl the Internet, and Sam's skillz may be the last defense from a neuro-virus wiping out humanity. The adrenaline-pumped action relentlessly levels up from caper novel to virtual combat to elaborate chases to military apocalypse, culminating in the traditional god-mode confrontation with the Final Boss. Plausible tech and a series of deftly detailed settings make up for pixel-thin characterizations, although thoughtful readers may be frustrated at the ethical dilemmas and sociological issues that are raised only to vanish like vaporware. But most will blast through to the epilogue, simultaneously satisfying and deeply unsettling, and eye their keyboards with more respect and a little nervousness. It started out harmlessly. A little hack to get some free neuro headsets for him and his best friend Fargas. Sam knew the hack was easy, but he still couldn't shake the feeling someone was watching. And then the invitation arrived. Neoh@ck would invite him to the elite of the elite if he could find their con. What did he have to do? Crack the firewall of the White House and find the virtual con. Sam did, and now the feds are knocking on his door. But there is more to it than meets the virtual eye. Sam runs into Dodge while incarcerated and makes a daring plan to escape. And his escape turns into the a proposition he can't refuse, working on what he does best. One that means life or death, protection of countries and their resources and governments, and a battle against Ursula, a virtual being that wants to take control of not only the what Sam and the crew are trying to protect, but of people as well, using the only means available to her...neuro headsets. WOWOW!!! Okay, this isn't quite a word you'd use for a review, but from the beginning I was hooked. Brian Falkner writes a YA thriller that does exactly what he set out to do - thrill the reader. A dystopian novel in a very futuristic, realistic way, Falkner writes about the dangers of the future involving technology, and one that could quite conceivably happen. Sam is one of those teens we all know...an extremely bright and talented person who walks, talks and lives for technology. He is vibrant, intuitive, and leaps off the pages as well as the other characters in this novel. The prologue will capture and the book will follow suit. I requested a guy read on the floor of ALA...the next best novel that will capture this audience. The rep at Random House handed me this...Brian Falkner's book will too with the guys. Due out late September. “Last month, the standards editor at The New York Times wrote a memo that shocked -- shocked! -- bloggers everywhere. He asked Times writers to avoid using the word ‘tweet’ (as in, ‘to say something on Twitter’). “That the Internet’s reaction was so swift and harsh only proves the point: the techno-savvy population can't even conceive of the existence of a less savvy crowd. If you use jargon every day, you can't imagine that millions of people have no idea what you're talking about. “I do a lot of public speaking. And even today, when I ask my audience how many know what Twitter is, sometimes only a quarter of the hands go up. -- from the July 7, 2010 New York Times Op-ed piece, "For Those Facebook Left Behind" by David Pogue (which I found through the headline on my personalized iGoogle home page). I have not heard a lot of the phrase "digital divide" in a while. But I did read the recent articles about Finland making access to broadband a legal right and President Obama pledging to expand broadband access throughout America. To me, a librarian who considers such tools essential for leveling the playing field on which we educate students in the Twenty-first century, this expansion of broadband is a positive thing. Not that I think everything about our brave new digital world is a plus. There are incredibly important privacy issues to be resolved -- if such resolution is at all possible. I also know that too many of us spend far too much time sitting in front of our laptops (like I am right now). It is summertime and I really should be making like Thoreau. You can bet that I am going to be a bit more mindful about the real dangers inherent in our digital world after reading nonstop through BRAIN JACK, a breathtakingly, fast-moving, futuristic, cyber-thriller about high school-age kids in which the population groups who are for and against the increasingly pervasive nature of the Internet end up warring against one another. It all begins with Sam Wilson sitting down in a cafe in lower Manhattan and hacking into the computer system in a high security building next door. Sam is a high school student and a hacker with extraordinary skills. In his successful attempt to alter some files on a server in the Telcoamerica buiding so that he can get himself and his best friend some free hardware, we observe Sam causing enough systems damage escaping detection (when tech people at Telcoamerica realize that their system has been compromised) that it takes three days for the Internet across America to be working at full speed again. The payoff for this invasion of Telcoamerica's system is a pair of top-of-the-line laptops and a pair of Neurotech neuro-headsets that are soon thereafter delivered to his door. These neuro-headsets are the newest in technology advances: one puts on the headset and it provides for thought recognition (you work on the computer using your mind in the same manner that we, today, have voice recognition programs for word processing). But what Sam missed, as he escaped out the back door of that cafe next to Telcoamerica, is that there was a security camera mounted out there. "He scanned the disk structure of the big server. "There were over thirty disk drives attached to the machine. He scrolled through the list of drives, wondering where to start. "It took a moment before that clicked. "NHC! Neoh@ck Con! It had to be, he thought as he accessed the contents of the drive itself. "The hackers had set up their own partition on one of the White House central server's disks and were using that for their meetings. On the drive was just a single file. An executable. A program. That would be the online-forum software he guessed. "His watch said it was 8:15. Too early. Not that he minded being early, but there might be risks in logging on too soon. The longer he was logged in, the greater the chance of being caught. "He alt-tabbed to bring the Neuro-Sensor software to the front again, but even as he did so, he realized something strange. For the last twenty minutes, he had been crawling around inside the computer network of the White House. He had activated programs, spun data-webs, even written short bursts of code. "But he hadn't touched the mouse of the keyboard at all." Utilizing that neuro-headset coupled with his unparalleled skills is how Sam is able to do all of this without touching the mouse or the keyboard. BRAIN JACK is the story of what happens after Sam is caught hacking the White House and after millions of people begin using these neuro-headsets. Oh, and the country is already beyond tense because Las Vegas was recently vaporized by a nuclear weapon that was detonated in a light plane on a charter flight. This is a red hot cyber suspense tale of extraordinary proportions. I dare you to tell me after reading BRAIN JACK that anything having to do with the Internet is one-hundred percent safe. And while it is quite possible that three-quarters of America will not even be able to understand half of what is being described in the prologue -- no less where the story takes us from there -- there will be a great number of teens who will find Sam Wilson's story to be the ultimate in reading experiences. Set in the U.S. in the near future, sixteen-year-old Sam Wilson graduates from talented computer hacker and petty thief to cyber warrior in an heroic battle against cyber terrorism. As a result of his daring attack on the computer systems of the White House, Sam is recruited into the Homeland Security, Cyber Defence Division (CDD), an unlikely collection of computer whizz kids whose urgent mission is to protect the country's cyber network from imminent attack. Tension is unrelenting in this fast-paced action novel and complex issues of ethics and science are seamlessly embedded within it. The characters are well developed, Sam is an engaging protagonist, with plenty of initiative and capable of great loyalty and friendship in situations of extreme danger; the motley cast of minor characters is full of individual quirks and idiosyncrasies. Extensive use of technical jargon and information does not interfere with the non-technical reader's enjoyment, and the projected innovations in cyber technology are totally convincing. A great read. Recommended for ages 12+. the Sir Julius Vogel Awards (for Science Fiction books), Brain Jack is a suspenseful story that I could hardly bear to put down. It follows Sam Wilson who is a brilliant computer hacker. His illegal activities bring him to the attention of Homeland Security after he manages to hack into Telecomerica, the White House and then hack his way out of detention. Employed by the government to watch out for nasties, he and the team uncover a plot where neuro-headsets have been used to take over the world. This is a fast paced action thriller, set in the near future in a United States where a bomb has razed Las Vegas and technology is taking over. Falkner has come up with some great technology and ideas about computers that I found fascinating to read. Sam manages to steal a neuro-headset for his friend Fargas and himself, and suddenly a keyboard and a mouse are no longer necessary. Fargas, in particular, gets immersed in an online game run by a computer body called Ursula, but when Homeland Security is threatened, Sam realises that the neuro-headsets are plugged into so many minds that they could be dangerous. Exciting escapes, intrigue, car chases and danger kept me on the edge of my seat as Sam, Dodge, Vienna and Ranger race to try and save the world from mind invasion and war. Sam's character is well-developed and believable and secondary characters well rounded. The conclusion is especially thought provoking and would engender a lot of discussion. I loved The tomorrow code by Falkner and this book is even more exciting. Recommended for readers who like adventure, computers or those who enjoyed Little Brother by Cory Doctorow. The ultimate challenge for a teen-fiction writer? Winning over computer-fixated teenage boys. 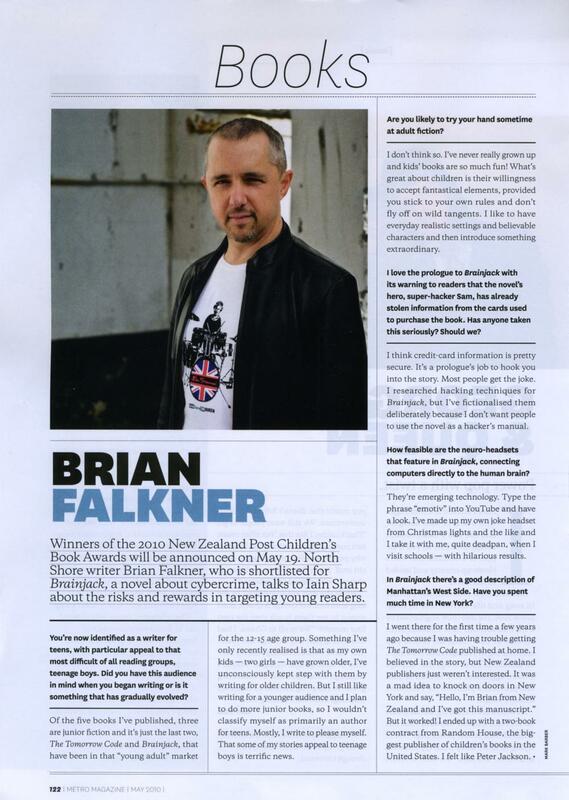 So when a copy of Brainjack, circulated among four young online gamers, came back well-thumbed with a popcorn kernel wedged into chapter 15, children’s book awards finalist Brian Falkner got my unofficial “parents’ choice” vote. He’s turned out a pacy, sci-fi thriller about young computer whiz Sam, who finds himself in deep trouble after hacking into the White House computer system. But when cyberterrorists threaten the world via the freaky new neuroheadsets (by which wearers can control their computers using only brainwaves), Sam has to use all his skills to help save the human race. Cool apocalyptic stuff, with a little philosophising woven into the action. The pacing of the book is outstanding! There is nonstop action once the story begins leaving little opportunities for the reader to stop and take a breath. All young adults secretly dream of being the best at something, at helping to overcome terribly odds and emerging as a hero. Sam, while a computer whiz, is also an average kid who helps young readers achieve vicariously the dream of being a hero. The many parts all works together in eliciting questions from the reader through deft foreshadowing as well as maintaining threads of continuity from one event to the next- threads of rights, responsibilities, and more. Ultimately the reader will be left wondering if Sam had the right to do what he did in healing the international rifts and programming people to do what’s right under threat. This is an excellent book to begin discussions about individual rights and freedom of thought. This is a must have for any collection, one reason being that good Science Fiction can be hard to come by for this age group. 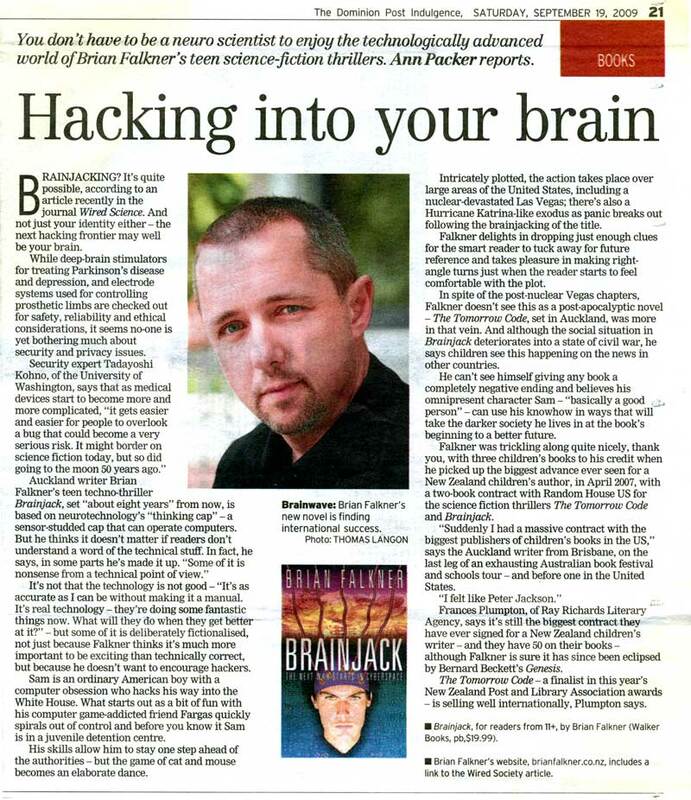 Brainjack is the latest offering from award winning New Zealand-based author Brian Falkner. It’s a fast-paced action novel set in the not-too-distant future in which a brilliant young computer hacker fights to stop the human race from being obliterated. Sam Wilson is a talented and immensely likeable teenage computer hacker. But Sam’s fixation on cyber space leads him into a dangerous world that includes espionage, intrigue and cyber terrorists. This techno-thriller is full of danger and excitement that touches on complex scientific and philosophical issues in an accessible way that younger readers over 12 will find both fascinating and enjoyable. Falkner successfully infiltrates the enigmatic world of the cyber hacker while the active nature of the text makes it good fodder for a film script. The narrative is gripping and the characterisations are believable. There is a fair amount of technical jargon, which this reader (a self confessed technophobe) is assuming is do-able, however in no way does the computer speak hamper the integrity of the story nor the flow of the action. Instead, it rather adds to the sense of mystery while assisting in creating the context and environment within which Sam is existing. Exciting reading for anyone interested in the future world of computers, with innovations such as ‘neuro-headsets’ that allow you to operate your computer with your brain instead of your fingers. The hero is a brilliant teenage computer hacker – Sam Wilson – whose antics lead him into a dangerous world that will test his skills to the max. It’s action-packed, with espionage, intrigue and a hint of romance. There’s a lot of computer-speak, with the occasional slip from the futuristic into more old-fashioned language. I wondered about the veracity of the computer procedures detailed in the story, so I was interested to find an author’s note explaining that this is ‘not intended as a manual for hackers’, so some techniques have been deliberately fictionalised. I’ll be interested to hear what the computer-savvy readers think. Sel in the U.S. in the near future, sixteen-year-old Sam Wilson graduates from talented computer hacker and petty thief to cyber warrior in an heroic battle against cyber terrorism. As a result of his daring attack on the computer systems of the White House, Sam is recruited into the Homeland Security, Cyber Defence Division (CDD), an unlikely collection of computer whizz kids whose urgent mission is to protect the country's cyber network from imminent attack. Tension is unrelenting in this fast-paced action novel and complex issues of ethics and science are seamlessly embedded within it. The characters are well developed, Sam is an engaging protagonist, with plenty of initiative and capable of great loyalty and friendship in situations of extreme danger; the motley cast of minor characters is full of individual quirks and idiosyncrasies. Extensive use of technical jargon and information does not interfere with the non-technical reader's enjoyment, and the projected innovations in cyber technology arc totally convincing. A great read. Sam Wilson, brilliant teenage hacker, is looking for trouble. And trouble is looking for him. He's trying to get into the most carefuly controlled pieces of cyberspace there is - but he has no idea of the danger that he's getting himself into, it's not just that the police might be after him, he's being chased by an agency he can't even comprehend. Ok, I'm a science fiction buff, so nothing in this book was particularly new, but it didn't seem to matter, it was a great roller-coaster. Lots of fun, lots of danger, and some really nice touches -- it makes me want to read his other book - the tomorrow code - to see if it's half as good as this one. About the author: I'm slow on the uptake (my excuse is that the book was published in Aus): Brian is actually an NZ author - born and raised in Auckland - which I wont hold against him, and is the author of several aother books besides this and the Tomorrow code (shortlisted for the 2009 New Zealand Post Book Awards for Children - Young Adults and the Esther Glen Award at the LIANZA Awards). The Flea Thing (shortlisted for the LIANZA Esther Glen Award, 2004), The Real Thing, and The Super Freak (shortlisted, New Zealand Post Book Awards, 2006). I’d have to say that I’m Brian Falkner’s number 1 fan. He is my favourite New Zealand author and just a really cool guy. He’s a passionate promoter of reading and writing and goes around lots of different schools throughout the country with his Story Sports programme. His books are all so original and his last few books have delved into science fiction, a genre that you don’t see a lot of in New Zealand children’s fiction. The Tomorrow Code was his last gripping read and I was glad to see it nominated for the New Zealand Post Book Awards this year (unfortunately it didn’t win). Brian’s amazing new book Brainjack has just been released and it gives us a glimpse at a not-too-distant future. A new piece of technology called a Neuro Headset has been introduced and is becoming popular all over the world. While wearing the headset you are able control your computer using only your brainwaves without the need for a keyboard or mouse. However, if people can hack into your computer through the internet, does this neuro connection allow them to hack into your brain? Sam, an experienced hacker, finds himself in deep trouble when he hacks into the White House computer system, but when cyber terrorists threaten the world, he will have to use all of his skills to save the human race. Sam Wilson, a 16-year-old particularly gifted hacker, is recruited to help save the planet from impending doom, in a frightening look at where technology could lead us. Sam finds himself behind bars in Recton Hall - a facility for white-collar juvenile criminals - those convicted of fraud, embezzlement cybercrime and espionage - after he is detected trying to hack into The White House's computer system. He is soon recruited to Homeland Security's Cyber Defence Division and becomes part of, with a nod to Men in Black, the first, lost and best line of defence against the worst scum in the universe. 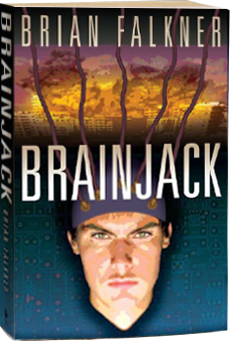 Brainjack is a very American novel, (yet it is sprinkled with reminders that the author is a New Zealander, such as the use of NZ colloquialisms like egg)with the feel of a big budget Hollywood film, It is action packed, fast and, at times, a little baffling, especially when it comes to hacker jargon. It is also a warning against the rampant expansion of new technology, The world takes up neuro-connection caps at an alarming rate faster than the take-up of mobile phones. While they do serve a purpose, allowing blind people to see and deaf people to hear, they also contribute to the catastrophic network meltdown and manipulation of the collective con-sciousness that Sam and his colleagues at CDD fight to stop, This is a cracker of a tale very now, very slick and very compelling. It is sure to find an audience of enthusiastic teens and, due to its action film script feel, should hold the interest of reluctant readers. Do you know anyone whose life revolves around computers? This book is for them. The Author’s note states: This is not intended as a manual for hackers. You could have fooled me. I was surfing through the network controller of an international telecommunications company and ducking when security spider tendrils probed too close. Hacking into the White House was really just part of the introduction. Brian Falkner’s tale reads like a fast-paced movie. 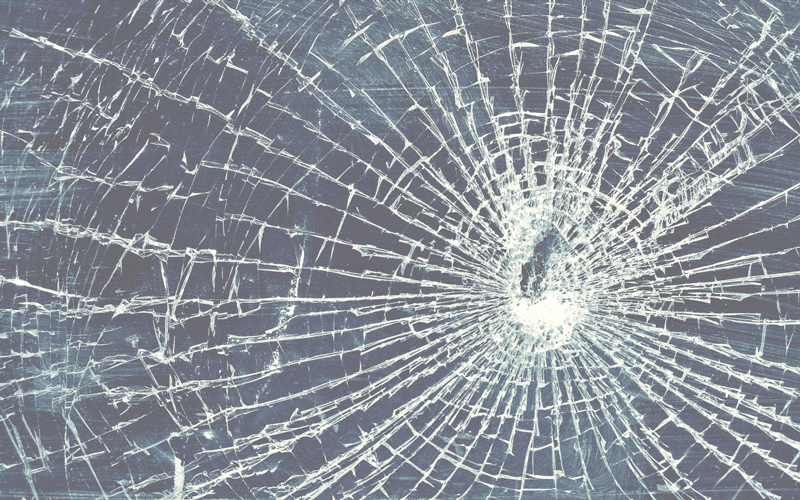 I felt the building shake and ducked splintering glass, then things got complicated. Distinguishing between the good and bad guys was a mind-bender in this cyber espionage thriller. Internet access for entire countries was shutdown at the flick of a code, but could wars really be caused (and run) by computers? Although neuro-headsets are a device of the future, they open the way to enormous power and even greater fear in Brainjack. The idea of working hands-free (no more keyboard or mouse) is one thing, but directly connecting your brain to the internet would have side effects, wouldn’t it? Brainjack is definitely for computer geeks and gamers, but even without understanding the computer lingo, I couldn’t put it down. Some parts freaked me out, but I still couldn’t stop reading. I bet the end takes you by surprise too. Was it any wonder that Sam found himself locked up in jail after hacking into the computer system of the White House? After once again employing his computer skills, he manipulates the security system of the jail and organises an escape. Safely outside he is approached by the Cyber Defence Division, a division of homeland security, who offer him a job safeguarding the nation from computer espionage. The secret world of espionage and cyber-crime can be a daunting place for a teenager but Sam is not fully aware of the deadly consequences of his decision. A virus has infected the world's computers and through the ultra modern headsets is altering the thought patterns of everyone who logs on. With the authorities convinced he is a terrorist and the police out to track him down, Sam and his two friends are forced to seek refuge in a part of the country where nobody will find them. Does Sam have the skills to track down the source of this virus and save the world or will he too become another victim? In this post-9/11 era, the cyber situations encountered by Sam are highly believable and are graphically described by Falkner. The plot revolves around Sam, the main character, who could be almost any teenage boy in the neighbourhood. The supporting characters play only a minor role as they flash in and out of the plot but this does not detract from the action. Computer technology terms and phrases are scattered throughout, providing further authenticity to the plot in this fast-paced action adventure that is full of energy and high adrenalin. From page one Brainjack provides enough twists and turns to keep the reader eager for more and although the content will appeal more to boys, it is a novel that can be enjoyed by both genders. Brainjack is a book to recommend, one that is supported by an attractive cover to draw the eye.